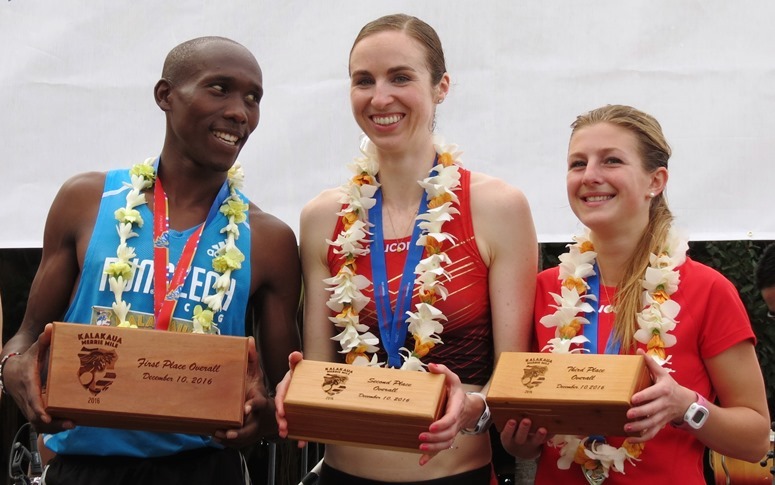 HONOLULU, HI, USA (10-Dec) — Overcome with emotion, Edwin Ngetich Kiptoo ran down Kalakaua Avenue next to Waikiki Beach and didn’t stop at the Kalakaua Merrie Mile finish line despite winning the race. After chasing down all the elite women, who had been given a 27-second head-start, and crossing the finish as champion of the inaugural race in 3:57.4, the Kenyan kept his pace up through the finish chute, blowing past cheering spectators and race volunteers. 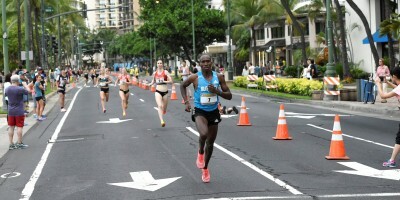 Kiptoo wouldn’t stop until reaching the Waikiki beachfront, when his manager Davor Savija flagged him down and got his attention. On his first trip outside of Kenya, Kiptoo didn’t want to slow down until he was assured that he had indeed won the gender challenge and its $3500 first prize. In what may be America’s only pro road mile with a handicap format, organizers only added a prize money purse last Wednesday, paying $3500-1500-1000 for the first three athletes to cross the line. Honolulu Marathon Association president, Dr. Jim Barahal, came up with the 27-second gap and hoped for a tight finish. Nicole Sifuentes, Shannon Osika, and Dominique Scott-Efurd led the women’s race from the gun, running three wide with Aisha Praught Leer and Erin Finn several steps back. Wanting to build a concrete buffer on the men, Sifuentes charged early figuring a cushion would be necessary with the likes of Kiptoo, Olympic 1500m finalist Nate Brannen, and 2014 NYRR Wanamaker Mile champion Will Leer in the field. “We just went out hard from the gun, so the whole thing was hard. I didn’t necessarily feel like I could speed up at any point because I was gunning it,” Sifuentes told Race Results Weekly. 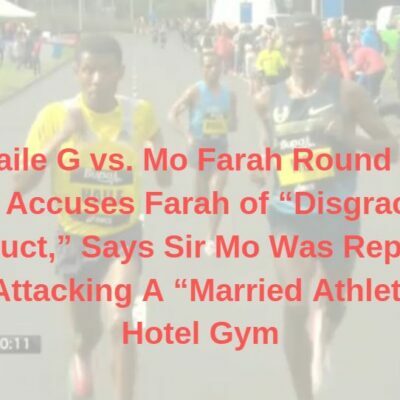 When the men started, Kiptoo promptly took the lead and wanted to front the male charge. He entered the race with a bold strategy. “I wanted to catch them before the turning point,” he explained. That was my plan.” Kiptoo quickly left the rest of the men’s field, which also included New Zealand miler Hamish Carson and USA steeplechaser Mason Ferlic, behind. 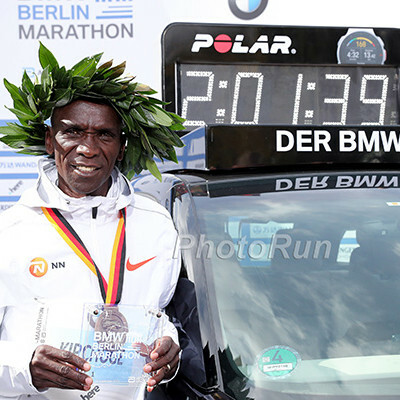 By the turn-around point –approximately a kilometer into the course– Kiptoo had accomplished his goal in part. He’d already caught up to Finn, and Sifuentes, Osika, and Scott-Efurd were only another 12 seconds ahead. The rest of the men were another eight seconds behind Kiptoo. Slingshotting around the hairpin turn, Kiptoo would overtake Finn and Praught Leer, then reeled in Scott-Efurd with roughly 400m to go. Able to see Sifuentes and Osika ahead, Kiptoo set his eyes on the pair of Saucony athletes and pounced in the final 300m. Neither Sifuentes nor Osika could respond to Kiptoo’s wheels (after all, he was the Kenyan national runner up over 1500m, having run 3:38.3 at altitude). Kiptoo managed to dip under four minutes for the win, clocking a time of 3:57.4. 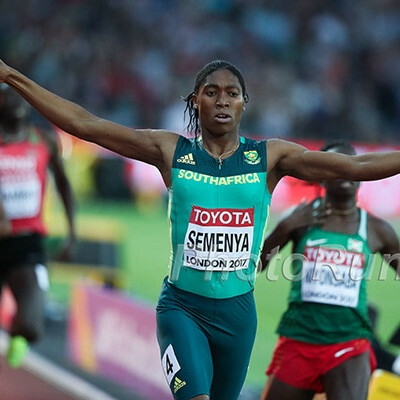 Yet the drama wasn’t over: With only the top-three athletes across the line earning prize money regardless of gender, Sifuentes and Osika had to make sure no other men would take them down. 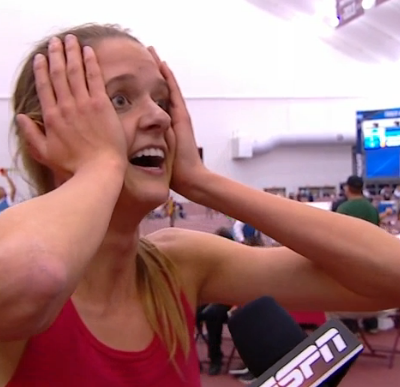 “Kiptoo just blew past Nicole and I and that was so scary. 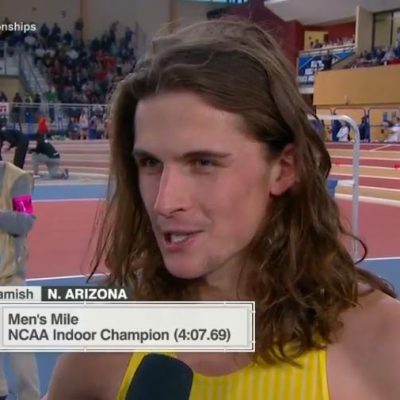 I thought the rest of the men were coming so we just hauled that last quarter,” said Osika, the 2016 Big 10 indoor mile champion with the University of Michigan. The two Michigan alums were rewarded for their efforts by placing second (Sifuentes) and third (Osika) in 4:02.1 and 4:02.5, respectively. Adding the 27 second handicap, both dipped under 4:30 with actual times of 4:29.1 and 4:29.5, strong marks considering the sharp turnaround. Brannen was the next finisher, leaning past Scott-Erfurd at the line to take fourth 4:08.1 to 4:08.4. Ferlic and Carson each timed 4:09.4 for fifth and sixth, while the Leer couple was eighth (Will in 4:15.9) and ninth (Aisha, 4:23.1) with collegian Finn rounding the field out tenth in 4:25.4. The overwhelming review of the Kalakaua Merrie Mile was that the gender challenge presented a unique, fun, and exciting opportunity to mix men and women on the same field of play. All athletes loved the raceformat. 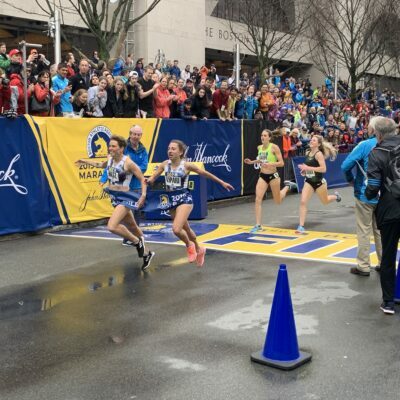 The race also gave University of Michigan alums a chance to compete for bragging rights: with four alums and one current student in the elite field, pride was on the line for the maize and blue. “It was just fun, having a bit of play between the men and women joking about who was going to bring it home,” said Finn. Prior to the elite race, a mass participation event saw 1,330 participants cover the road mile. Japanese marathoner Yusei Nakao –who will race tomorrow’s Honolulu Marathon– won in 4:43. The women’s winner was New Zealand triathlete Annika Pfitzinger, daughter of USA Olympic marathoner Pete Pfitzinger, in 5:04. 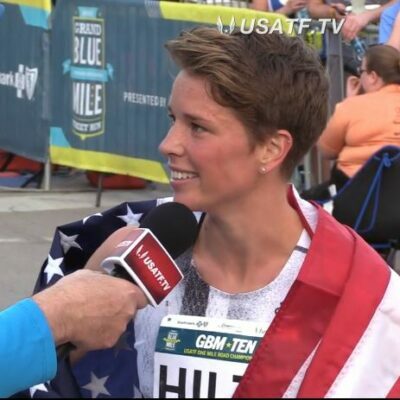 The third place woman was Sierra Willis, wife of two-time Olympic medalist Nick Willis, running a personal best of 6:09. Sierra Willis’s new PB is thanks in part to The Miler Method, a six-week training boot camp that the husband-and-wife team created for people wanting to run a mile. The Miler Method was just launched to the public this week and was featured in New York Magazine. The 44th running of the Honolulu Marathon will be held tomorrow morning, beginning at 5:00 a.m. local time (15:00 GMT). The leading entrants are 2016 Olympic Marathon silver medalist Feyisa Lilesa and 2014 Boston Marathon winner Buzunesh Deba. Race Results Weekly will provide exclusive coverage from the event.